For readers who made it this far, tell me — did I get my $87.66 worth? Because that’s what the Town charged me for asking the Mayor a question — a question that required 3.5 staff hours to document that “the last three fiscal years” doesn’t include the most recent fiscal year, which ended June 30, 2013. The Assistant Town Manager took half an hour to write that, the Clerk spent half an hour on the email, and the Treasurer devoted 2 1/2 hours to find the same information Mr. Panek said was “pulled” from the audit reports for the Mayor’s Message. And yes, I learned my lesson — no further questions, Madame Mayor. Asking questions costs money now? I’ll tell my kids. Absurd. Good luck getting any information out of the people running this town. I have spoken out at several meetings and have never — and I mean never ever — had one question answered. Let’s face it — if none of them know where the front of the historic old school is, how could they possibly answer questions about the REAL DEBT that they are creating? Until we have some honest, responsible people governing and managing this town we will never get any straight answers about anything! Elections are coming in May — perhaps then we can get some honest answers. Once again, I am struck by the ongoing imperious behavior of Cape Charles’ elected and non-elected officials. All of these men and women supposedly work FOR the (unfortunate) citizens of the Town. However, each new article in the Wave shows that all these administrators believe that Cape Charles residents are the serfs that live to serve their masters’ whim — and how DARE they question their masters? All I can say is, I sincerely hope Mr. Southern did NOT pay this insulting bill, and May can’t come soon enough — hopefully the folks that vote are paying attention. Keep telling the truth, Cape Charles Wave. I have always had the same thought. I lived in Henrico County and paid county taxes. People living in Richmond paid city tax. Is this the only double taxation in the state? This is another excellent article. 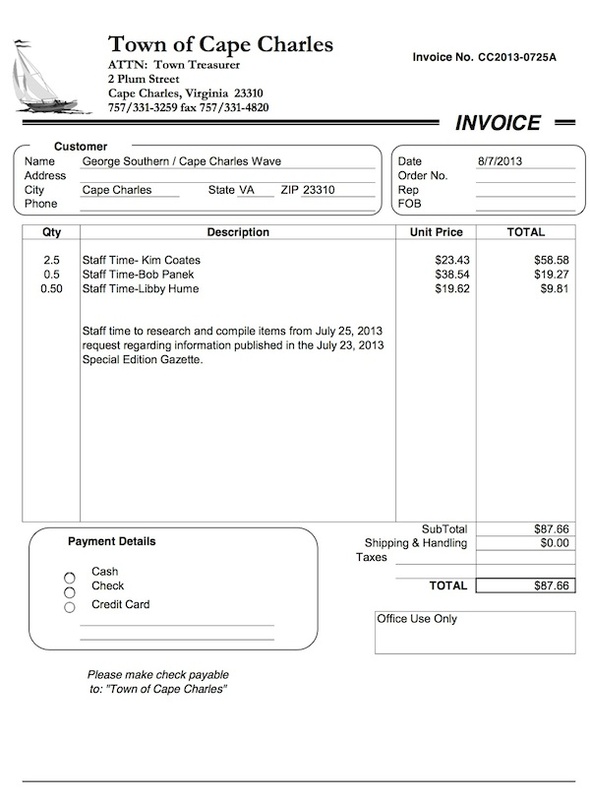 Not long ago I asked a question of the Town and was charged $25 when they treated it as a FOIA request. They seem to want to discourage questioning — not exactly democratic to discourage citizens from questioning their elected officials. On double taxation: our Town Fathers and Mothers should look into the cost benefits of becoming the City of Cape Charles — it looks like we would all be saving a lot on tax dollars. May really can’t come soon enough. Vienna does not operate a sewerage plant; it is handled by the Fairfax County Department of Public Works. While both Vienna and Cape Charles are towns within the Commonwealth, it is unfair to suggest that Cape Charles’ tax structure should be compared to Vienna without looking at the systems operated by both municipalities. 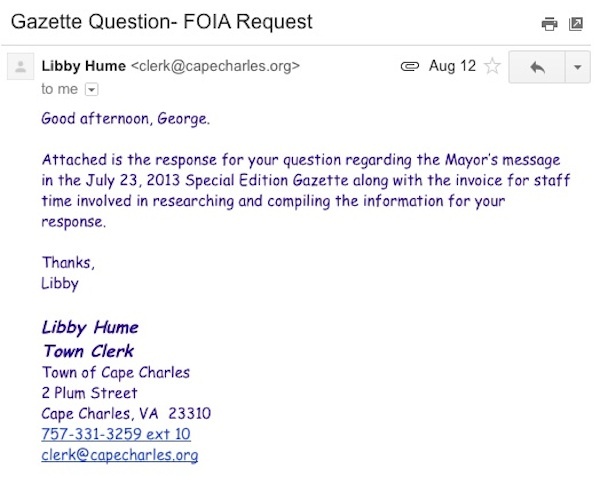 GEORGE REPLIES: The comparison to Vienna was about access to the mayor, but since you mention sewer plants, remember that they are supposed to be funded by the ratepayers, not the taxpayers. Based on this language, it seems to me that the cost of drafting emails, etc., is not justified under the act. The way I read it, you were asked to submit your question in writing by Town staff. 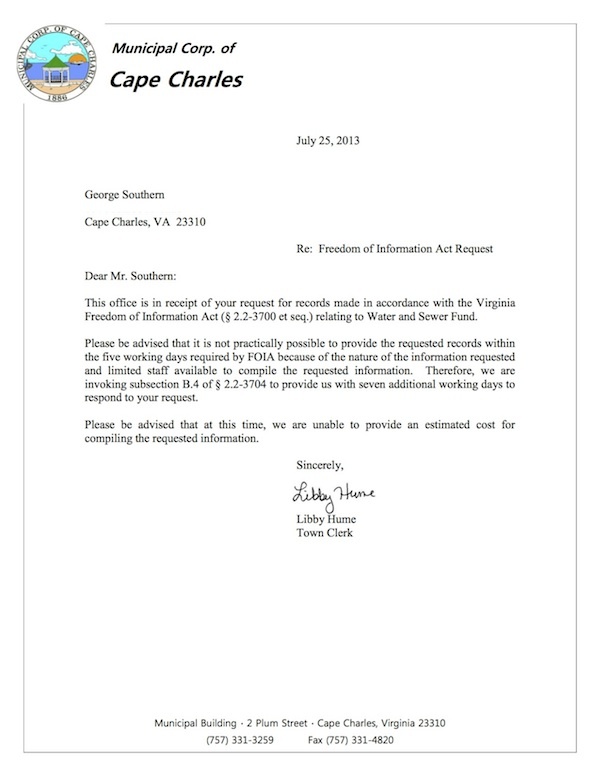 Town staff then replied that they were going to treat it as a FOIA request. They made it a FOIA request, not you! For that reason alone, I wouldn’t pay it. And this doesn’t even address the validity of the bill based on the answer the staff replied with. 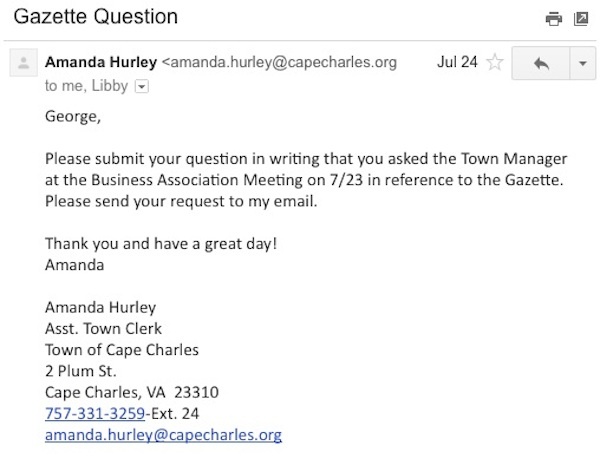 Can someone please explain the schedule of operating income and expense that the town clerk used in her response to George? What is the negative non-operating expense composed of? What does it require to become the City of Cape Charles? Would this mean the double taxation at present would be eliminated along with the elimination of the Council and Administration. What are the benefits of being a Town vs a City? Are there any? In other words, how do we eliminate the double taxation a family pays by living in Cape Charles? Wow! I would never want to live in this town, with the people you all have running it! I have lived in Richmond, Henrico County, and now Hanover County, and have never seen such a bunch as you all have in your town. Good luck to you; I think you all need to seriously think about replacing them all. 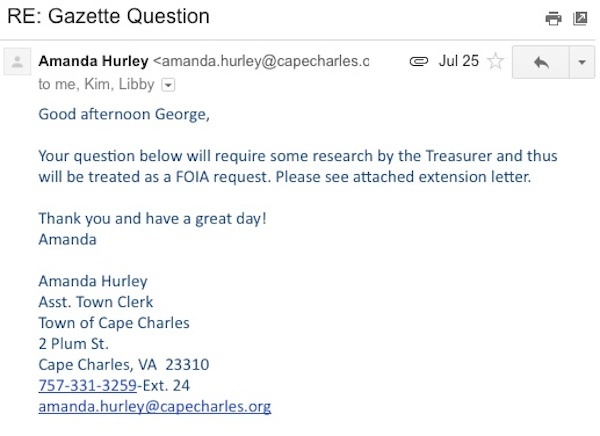 I also think that because the town changed your request to a FOIA, in the message they should have told you there would be a cost, and ask you if they should proceed or not. That in itself is common courtesy, something apparently your leaders are lacking in. @Joe McSpedden: I’m pretty sure there’s a minimum population requirement for legal City status in the Commonwealth, and I don’t think Cape Chaz is quite there. From what I understand, you’ll need about another 9,000 people calling the Town home plus your own court system. I’ve heard that the reason there are so many tiny incorporated towns on the Shore is because the Commonwealth was planning to raise the population requirement to incorporate, and several of the then villages decided to go for it. (I think the minimum now is 1,000). For some, it seems to make at least a little sense (Cape Charles, Onancock, Exmore). For others, well, I’m not so sure (Keller & Melfa come to mind — no offense to the Kellerites or Melfans). I’m not saying ALL the existing towns incorporated at that same point, but I think some did. I would contest that bill. It’s not even a direct answer to your question, which could have been easily answered by the mayor or, presumably, almost anyone else in the Town office: “By ‘the last 3 fiscal years’, I meant 2010, 2011 & 2012, NOT 2013.” Instead, it looks like they seized the opportunity to teach you a lesson about asking questions. 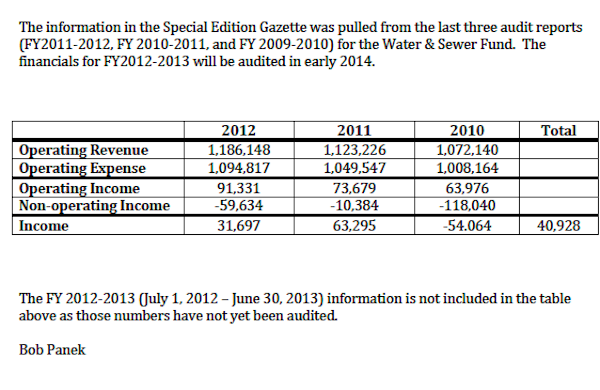 What does the county provide the taxpayers of Cape Charles? The most important is the school system — I will leave it to the more well-informed to comment on the quality. The county, I assume, has a line item budget for the school system at the 3 levels. Divide the total by the number of students, and Cape Charles will pay on a per-student basis. We already fund a generous police budget. Cape Charles residents are not noted for their high crime rate. When the paper lists the home of a defendant, it may list Cape Charles, but probably does not mean within the Town limits. It would be feasible to fund a court system for the City of Cape Charles to operate an hour per month to take care of all the crime — two or three speeding tickets. I am at a loss to think of any other service that I receive for my County tax dollars. Someone may be able to enlighten me. In my previous note, I forgot to mention the residents of Cape Charles who pay a “triple tax.” I am referring to the parents that pay tuition to the Christian School or Broadwater Academy. There’s a really simple way to solve the double-tax problem for Cape Charles. Unincorporate the town. Several towns across the state have done that already. No more town means no more town taxes.